AROUND this time a couple of years ago, Bridgestone released the S20 – a replacement for the BT-016 Pro, aiming to deliver more grip and better wet-weather performance. 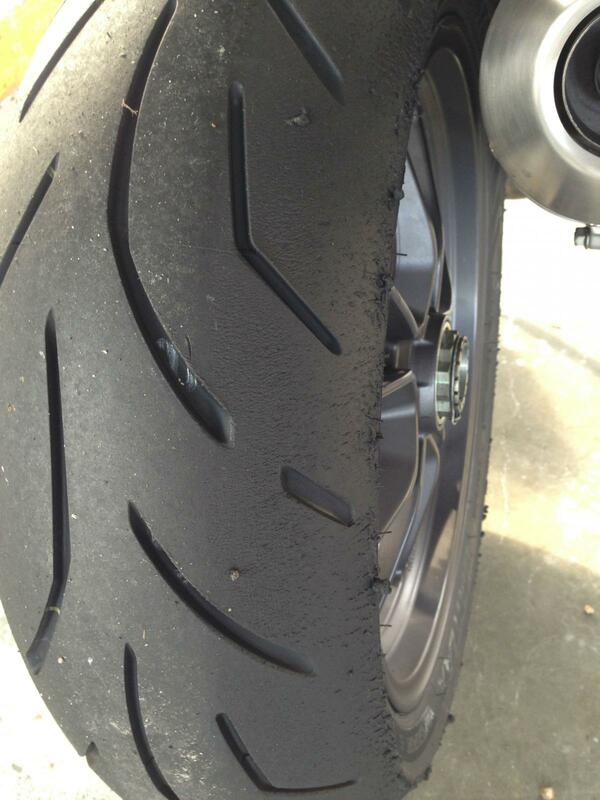 Badged as a ‘premium sports tyre’, the S20 was launched on the technical Portimao circuit and went down a treat in the eyes of almost everyone who rode on them. It wasn’t, and isn’t, just an out-and-out sports tyre though. It’s aimed at riders who ride on all types of road, and through all conditions. Now Bridgestone has released the S20 EVO, a tyre that looks to keep all the properties that made the original S20 such a success, but improve stability and handling, with an emphasis on enhancing performance on track, and increasing rear tyre life. On a scale of one to four, one being a sport-touring tyre and four being a full-on racing tyre, the S20 is sat firmly around the two mark. The new EVO is designed to be everything the S20 is but with a larger cross-over into section three. A sort of BT-003RS and T30 hybrid you could say. How are they doing this? Well, the front tyre now has a five-filament belt construction - compared to the original tyre’s dual-filament - for increased front stiffness, meaning extra feedback and better cornering properties. Interestingly they’ve done the complete opposite on the rear, going from a five-filament belt construction to dual-filament, in a bid to improve the rear contact patch. The EVO also has increased vertical and lateral stiffness compared to the old tyre. The science behind it was never going to be the fun part, but according to Bridgestone, these tweaks mean it will provide better feedback when accelerating out of a corner. And it won’t be at the expense of tyre life either, the EVO now uses a five-layer compound on the rear tyre- instead of just the three in the old S20 - with a new hard compound in the centre for extra mileage. Bridgestone say the EVO will last roughly 22% longer than its predecessor. 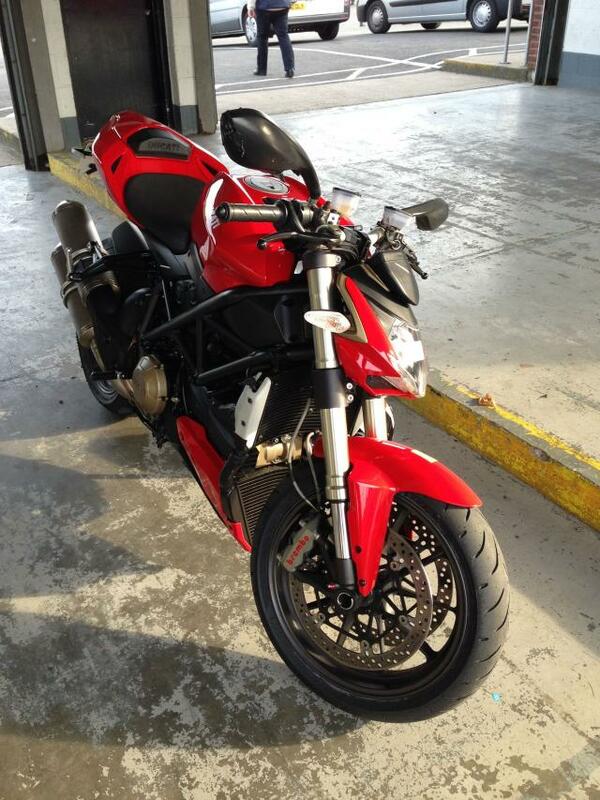 The tyres were fitted to my Ducati Streetfighter 1098 yesterday morning at FWR in London. They had around 55 miles of street-use before having to contend with four sun-baked evening track sessions at Brands Hatch with No Limits Track Days. 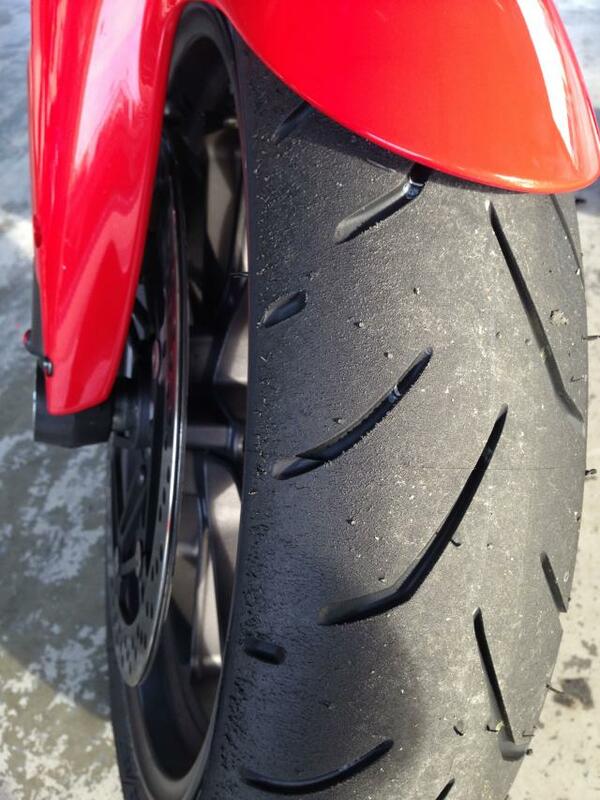 I set the front tyre pressure when warm to 32psi, leaving a slightly lower 30psi in the rear. Using the first session to scrub in the tyres, I wanted to ensure I had plenty of confidence to push them through the various off-camber corners around the Indy circuit at Brands. Coming out of Clearways I shifted up through the gears, letting the Ducati’s low-down torque hurl me down the Brabham Straight before braking heavily into Paddock Hill Bend. Despite being only two laps in, the front tyre gave me plenty of feedback under braking and on corner entry. The EVO’s profile makes it perfectly suitable for both road and trackday use; it has a quick turn-in, but still retains the type of composure you’d expect from a more rounded tyre when on the straights. Even on a bike like the Streetfighter, with wide bars and little weight over the front end, I hit an indicated 140mph down the front straight and the front still felt planted. After a quick breather, and satisfied that the tyres were now as scrubbed-in as they ever would be, I went back out for session two. This time I upped the pace by around 25%, but after five laps something didn’t quite feel right. The front was starting to feel vague and push wide, whilst the rear stepped out on me by about a foot after a rather large handful of throttle coming out of Druids. I pulled back into the pits and checked the tyre pressures, the front was at 37psi whilst the rear had risen up to 40psi, far too high, and my fault for setting the wrong pressures in the first place. I let both tyres down to around 30psi hot and went back out on track for session three. What a difference. After a couple of cautious laps due to no tyre-warmers, I really got stuck in. Warm-up time on the EVOs took only a couple of laps before instilling enough confidence to carry heavy brake and high lean angles into corners. You won’t get away with murder on them but you’d be hard pushed to not feel the tyre giving way. Even in session two when the rear let go due to overheating, it gave me plenty of time to react and wind off the throttle. Importantly, they provided consistent grip too. After a couple of red flags went up, No Limits added an extra five minutes to our 15-minute session. The EVOs felt just as good after 20 minutes of ragging as they did at the beginning of the session. My worst fear when riding a bike on track is losing the front end, mainly because it’s so much harder to recover than when the rear spins up. But the front never gave away any inclination that it was about to let go, a real-confidence booster, and means you can spend less time worrying about the tyres and concentrate more on your riding. I highly rate the EVOs and if they truly live up to Bridgestone’s claim of a 22% increase in rear tyre life, then that's just the icing on top of an already accomplished cake. They cater to the type of riding a lot of us do, or at least think we do, by being suitable for fast road use, trackday use, and being perfectly capable in adverse weather. Full UK road test to come soon. 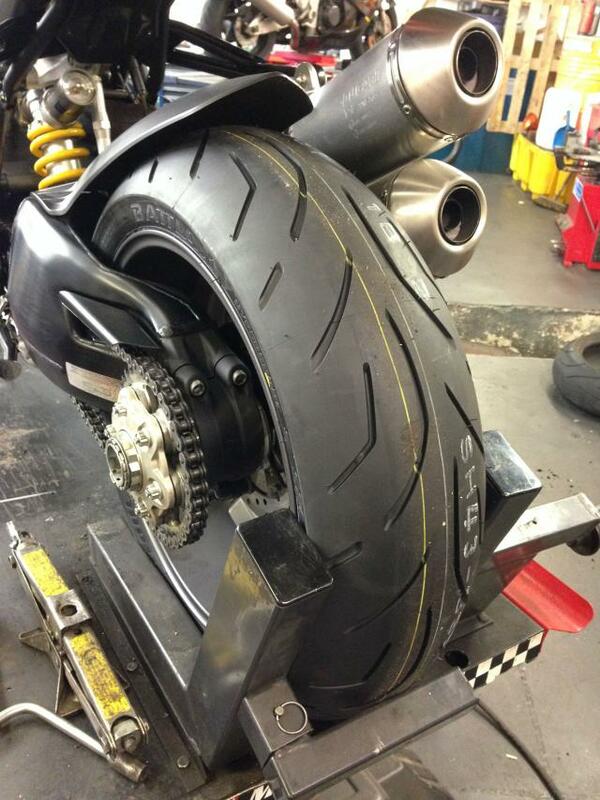 Click here to buy these tyres, or call FWR on 02078207818 quoting Visor14 for a 5% discount.